The first set of Global Guidelines for veterinary dentistry has been launched by the World Small Animal Veterinary Association (WSAVA) to support veterinarians around the world in improving recognition of dental disease and in providing a higher standard of dental care to patients. In addition to enhancing current standards of veterinary dentistry, the WSAVA hopes that the Guidelines will help to bridge what it perceives as a significant gap in veterinary education globally and to encourage a greater emphasis on dentistry in the veterinary curriculum. 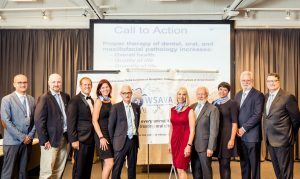 The WSAVA’s Global Dental Guidelines, launched on Sunday 24 September 2017 during WSAVA World Congress in Copenhagen, include information and images of oral anatomy and common pathology, as well as best practice recommendations for oral examinations and an easily implementable dental health scoring system. Evidence-based guidance on periodontal therapy, radiology and dental extractions is also included, together with details of minimum equipment recommendations. A key theme is the WSAVA’s rejection of anesthesia-free dentistry (AFD), which it describes as ineffective and a cause of unnecessary stress and suffering to patients. The Guidelines have been developed by the WSAVA’s Global Dental Guidelines Committee (DGC) whose members include veterinary dentists from five continents, together with representatives from the WSAVA’s Global Pain Council, Global Nutrition and Animal Wellness and Welfare Committees. They are based on the WSAVA’s three-tier continuing education system to ensure that they are relevant for all veterinarians, whether they are working in an advanced hospital setting or in a clinic in a country in which companion animal practice is still developing. Dr Brook Niemiec, a Board-Certified Specialist in Veterinary Dentistry of the American and European Veterinary Dental Colleges and a Fellow of the Academy of Veterinary Dentistry, is Co-chair of the WSAVA DGC. He said: “Dental, oral and maxillofacial diseases are, by far, the most common medical conditions in small animal veterinary medicine. They cause significant pain, as well as localized and potentially systemic infection but, because pets rarely show outward signs of disease, treatment is often delayed or not performed with a corresponding impact on the welfare of the patient. In developing the Global Dental Guidelines, we felt that the lack of perception of patient pain was a key issue. He added: “Our patients are not well served by the current variation in standards of care, level of equipment and procedural knowledge of dentistry. Misinformation which clouds the sector is a further hindrance. As clinicians, we cannot allow a fear of the unknown, the discomfort of client pushback or ignorance of current techniques to keep us from doing our best to relieve pain and suffering in our patients. The WSAVA represents more than 200,000 veterinarians worldwide through 105 member associations and is focused on enhancing the clinical care of companion animals. Its core activities include the development of WSAVA Global Guidelines in key areas of veterinary practice. These Guidelines aim to support veterinarians by setting standards for care and recommending best practice. Vaccination, nutrition and pain management are already served by WSAVA Guidelines.